Assessment doesn’t have to mean test—and that includes summative assessment as well as formative. I re-realized that this week when I gave an assessment that I’d formulated just as a sort of creative break from the essay grind. 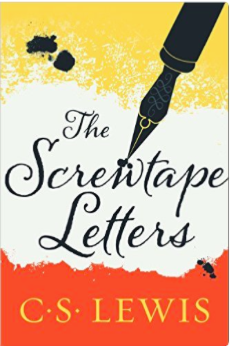 Last week in AP Language we wrapped up our study of The Screwtape Letters by C.S. Lewis. I chose the book for prolonged exposure to satire, which students have trouble identifying on the AP test, for its classic status, and for its Christian perspective. And then there was the slightly quirky assessment: A new letter from the senior devil Screwtape to his nephew Wormwood advising him on the best ways to tempt his “patient”--who is not now a man in World War II London, but a student at our 21st century international Christian school. This place reeks of our Enemy’s presence, but no matter, I always appreciate a decent challenge. I must point out that we do have a few things going our way for this matter. One is that the very fact that it is a Christian environment will be their undoing, with all of their rules and regulations. As we both know, the more rules that are placed upon a teenager’s shoulders, the more they will go out of their way to break these rules. Start off with making the girl annoyed with everything her parents do: the way they chew their food, the way they cough, and even the way they hum a song while doing chores. Exploit her own wit, Wormwood.… Convince her that she may say whatever is on her mind, no matter what the circumstance. Not only will this cause a problem for her elders, but also conflict her internally. She will not know what is whimsical and what is a wisecrack. Rudeness and retort are your strongest tools. Dare her to use them as weapons of sarcastic destruction. His mind is filled with anxiety and embarrassment from being a new face at the school…. His classmates are the believers of the Enemy, welcoming the patient’s arrival.…“Love your neighbor as yourself” (Mark 12:31). This verse is what the Christians repeatedly use to spread the great “love” from the Enemy. However, do not let them inspire your patient’s spiritual perspective just because he is treated with “love” they had given. Keep him distracted with egotism and the superiority of his thoughts and ideas. Relationships are the soft spot of your patient, and by soft I mean softer than the clouds up in heaven.… Let your patient be fooled by the lust of her partner; let the word “love” be used when it is not true. It is amusing just how hypocritical humans can be. They often express their idea of individuality and love for those who are “different,” and yet they immediately conform to what everyone else is doing.… Their friends become their source of purpose and happiness. Why did this work so well? If I can figure this out, I can do it again! I had clearly articulated objectives: I wanted students to understand how satire works, and to understand the purpose of this particular satire. This assignment was not just a fun break from “real” writing, but because it called for transfer—taking what they knew about Lewis’s style and purpose and transferring it to a new character and a new audience—it really demonstrated mastery of that purpose and that style. They made it their own. Students could choose the “patient” within the school (themselves, a friend, or an imagined person—sometimes one of the opposite gender, which is an act of imagination that always awes me) and the situation, and—yes—could every so often write in a non-essay format. Even in English class. The assessment caused as well as demonstrated learning. Students had to extrapolate what Lewis said about the foibles and temptations of an Englishman in 1941 England to general human weaknesses, and then apply that to teenagers in their own situation. I know they learned some things for the AP test. I hope they learned some things for life. I wonder how I can apply what I learned to other assessments in other units and other classes. *Student writing used with permission.